Our selection of Flammable Liquid Storage Cabinets are fully compliant with the advice given from the HSE and the DSEAR regulations. You can store small amounts of flammable materials indoors or near to a work area. Our flammable liquid cabinets are often found in laboratories, factories and work shops. It is particularly important to store flammable liquids away in cabinets when the flammable materials are not in use. Because of this we have a range of petrol cabinet and flammable liquid storage cabinets to help. 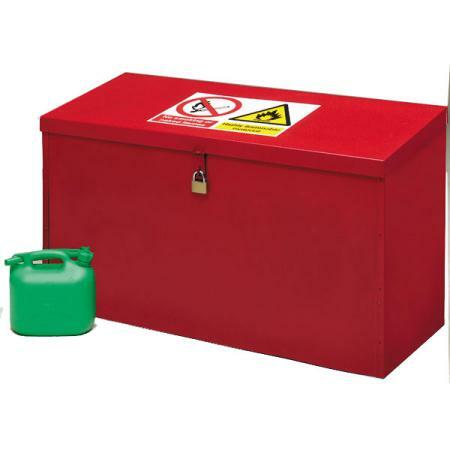 We also have a selection of flammable liquid chests with angled lids. Hence this discourages article placement on top of the unit. It is better to store flammable liquids in separation from any other hazardous substance. Other dangerous substances may enhance the risk of fire. Also other hazardous substances can affect other substances within the cabinet. Our petrol cabinets come in an eye catching epoxy powder coating red finish. They are complete with all warning and advisory decals. They each have a welded sump which is liquid tight. The sumps can retain spills of up to 110% volume of the largest container in the cabinet. Furthermore our flammable cabinets feature a truly robust construction. They offer the provision of high security and peace-of-mind. This is thanks to three-point locking. For even higher security some petrol cabinets have 7 lever locks. In addition some cabinets also have full length heavy duty hinges too. Finally the cabinets include sturdy stands which can keep them 500mm off the ground. 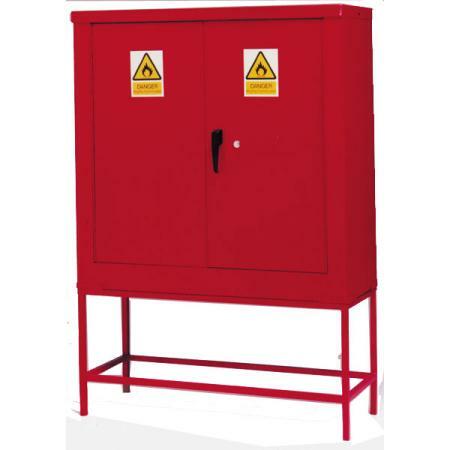 These petrol and flammable cabinets comply with the COSHH regulations for safe storage as appropriate. Therefore for safe and secure storage of all your flammable liquids, including petrol, this collection of strong flammable cabinets and cupboards certainly fits the bill. If you are storing other types of chemicals, it’s important to choose the correct type of storage cupboards. Take a look at our Acid & Alkali cabinets or general hazardous storage cabinets for a wider chemical cabinet selection.